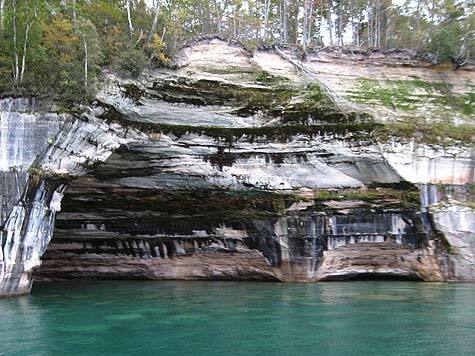 The "painted rocks" on the sculpted cliffs that comprise the Pictured Rocks section of the park shoreline are formed by groundwater and springs rich in various minerals (iron, manganese, copper, lime, etc.) that leak out of cracks in the rocks and trickle down the rock face. Since this process is ongoing the canvas is constantly changing, evolving into new works of art. Our pictured rocks tour cruise was on an overcast evening and nightfall descended upon us before the cruise was finished. But the low light conditions didn't diminish the beauty of the rocks and we all thoroughly enjoyed the experience - - - and are looking forward to a return visit for a daylight cruise or a mid-summer evening cruise on a clear evening. The photos below are but a small sample of the unique landscapes of Mother Nature. Fantastic Cave Paintings. The Sea Caves are neat attractions in themselves yet made more so when they are painted with these striking colors. The shear rock walls are a perfect canvas for Mother's creations. Pictures suitable for framing. In addition to the painted rocks there are unique formations like chapel rock, miners castle, and indian head rock. See More Pictured Rocks Photos (from Daytime Cruise) More Photos of Pictured Rocks Here. 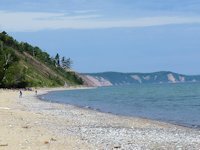 See Sunny Daytime Cruise Photos of Pictured Rocks Here. 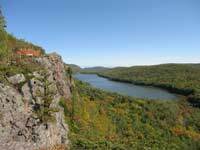 Get an Adobe PDF file from the National Park Service showing hiking trails and campgrounds. 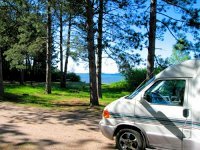 Other Resources to Plan Your Visit to Pictured Rocks National Park. 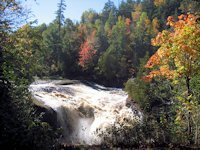 Pictured Rocks National Lakeshore Park - Western side: Munising Area - Miners Castle, Miners Falls, Visitor Center.